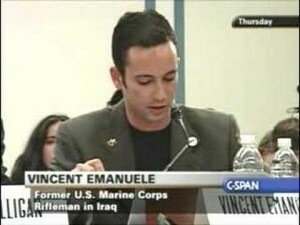 Editors Note: this article is written by our good friend Vincent Emanuele, an Iraq-war veteran who testified during the Winter Soldier hearings and has been at the forefront of radical resistance to U.S. imperialism. He brings a powerful, unique perspective on the violence of this culture. We invite you to consider his words. The Left needs to be resilient and serious, because the future isn’t going to be nonviolent. Lately, there’s been a rash of politically motivated violence in the U.S. from both state and non-state actors. Interestingly, the same is true in Australia, as right-wing organizations such as Reclaim Australia (RA) and United Patriots Front (UPF) display their violent tendencies during street protests and target left-wing activists on city streets. In both cases, at least in my thinking, these violent acts will only escalate, which raises important questions about political violence, security, and the state. Right-wing Violence in the U.S. In the U.S., three key events have taken place in the last two weeks. The day my plane landed in Chicago, Monday, November 23, five Black Lives Matter protestors were gunned down while protesting the police shooting of Jamar Clark in Minneapolis, Minnesota. So far, the Minneapolis Police have arrested three suspects, all of whom are white males in their twenties. The next day, on November 24, Chicago Police released video footage of police officer Jason Van Dyke shooting Laquan McDonald sixteen times, instantly killing the seventeen year old. Laquan’s murder took place over a year ago, yet the video was just released to the public. Audio recordings from police dash cameras were also missing. According to the Chicago Police Department (CPD), the missing audio can be attributed to “technical difficulties.” Additional reports have concluded that Chicago Police officers entered a nearby Burger King and tampered with the restaurant’s security footage, deleting almost 86 minutes of video. Fortunately, activists and organizers have responded to all three events with protests and acts of civil disobedience. In Minnesota, hundreds of protestors took to the streets the day after white supremacists shot members from their encampment. In Chicago, protestors halted traffic and blocked stores on the historic Magnificent Mile during Black Friday (the largest shopping day in the U.S.). Further, pro-choice activists, gun control advocates and those who support Planned Parenthood held rallies and actions throughout the U.S.
At the same time, it’s important that activists have serious and critical conversations about security and the state. To put it differently, can activists develop alternatives to state security apparatuses? One step could be civilian oversight boards or committees who have the power to terminate officers and regulate their behavior. But that’s only one step. What about actually replacing the police? Are left-wing activists prepared to provide security in a nation (the U.S.) that has over 300 million weapons? Could left-wing activists have effectively responded to the recent shooting at Planned Parenthood in Colorado Springs? Of course not. After all, leftists don’t have tactical units or armored vehicles. After the shooting of BLM activists in Minnesota, the Left still relied on state security forces to provide actual protection, conduct detective work and potentially prosecute suspects. Are leftists prepared to perform these unfortunate but necessary procedures? Read the rest of the full article here: Is the Left Prepared for the Right’s Terrorism? This entry was posted in Repression at Home, White Supremacy and tagged Militarism, Nonviolence, Police brutality, Vince Emanuele. Bookmark the permalink.